You can't fit a dimmer to control fluorescent lights or low energy bulbs. It just won't work. Dimmers are just switches with an additional controller which reduces the voltage to the light as you turn the knob so making it dimmer. Dimmers look slightly different to standard switches being much more chunky. 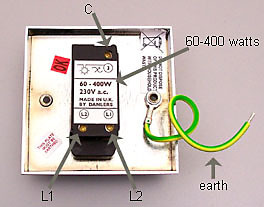 They usually come supplied with a common(C), Line out(L1) and Line out(L2) terminals similarly to a two way switch. Sometimes all three terminals are in a row. An important consideration is that dimmers have a power rating and can only be used to switch a limited number of lights. Count up the lights the dimmer is switching and find out the wattage for each bulb. Add this all to get a total wattage. You'll need a dimmer with at least that or greater. If it's less than the dimmer may work for a while then quickly burn out. Metal dimmer switch rated up to 400watts. NOTE the earth cable. All metal fittings must be earthed. Connect this to the earth inside the light switch fitting. If you can't find an earth call a qualified electrician.